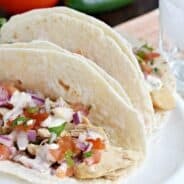 Easy recipe for Chicken Salad served on whole wheat tortillas! Ready to eat in 15 minutes! So I’m thinking you all might still be in a sugar coma from Halloween. Yes? The weather was pretty stinky here…it’s a good thing the candy I bought to pass out is the candy I like to eat. Oh wait, maybe that’s a bad thing! Anyways, I know I just shared a savory dish with you earlier this week (remember this Stovetop Beef Enchilada Mac and Cheese?? ), but I thought you all might enjoy another lighter dinner option. And free of all sugar. 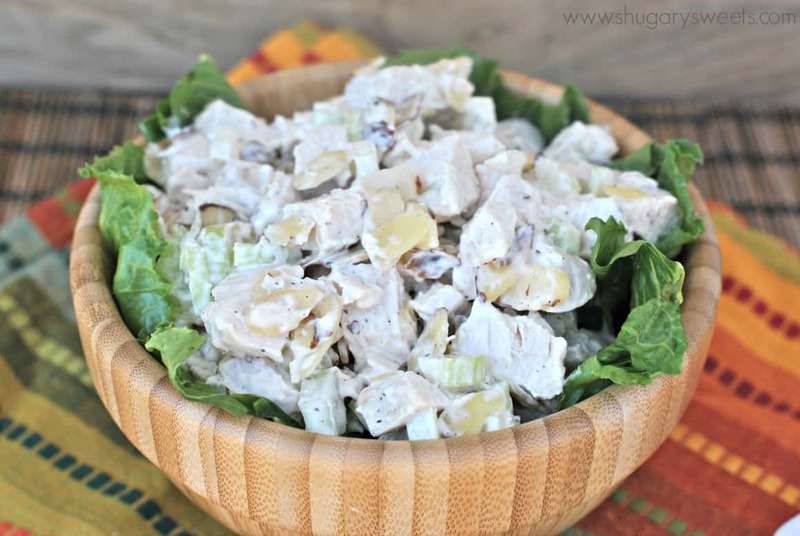 This chicken salad is my aunt’s recipe that I just LOVE. Not sure where she got it (or if she made it up herself…Aunt Sandy??yes? no?). It’s so easy to whip up a big batch and serve for lunches. Brunch. Dinner. You name it. I love serving it on big crescents, however in an effort to eat a *little* more healthy, I thought we could have some chicken salad on a whole wheat tortilla. I like to cook extra chicken breasts during the week when making dinner. I cube them and stick them in the freezer. When it’s time to make something simple like this Chicken Salad, I take out the amount of cooked chicken I need and let it thaw. Easy peasy! 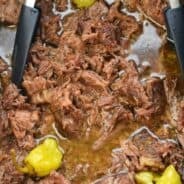 Before I share the recipe, can I ask a quick question. Is it too soon to start sharing peppermint treats? Cause I’ve got a some good ones coming to the blog soon, and I would hate to have you write mean messages to me. So, consider this a warning…holiday treats coming soon. Not that you have to make them as early in the season as I do, but feel free to Pin them or print them for planning purposes! Or feel free to ignore them until you’re ready. Search through my archives for your favorite pumpkin dishes! 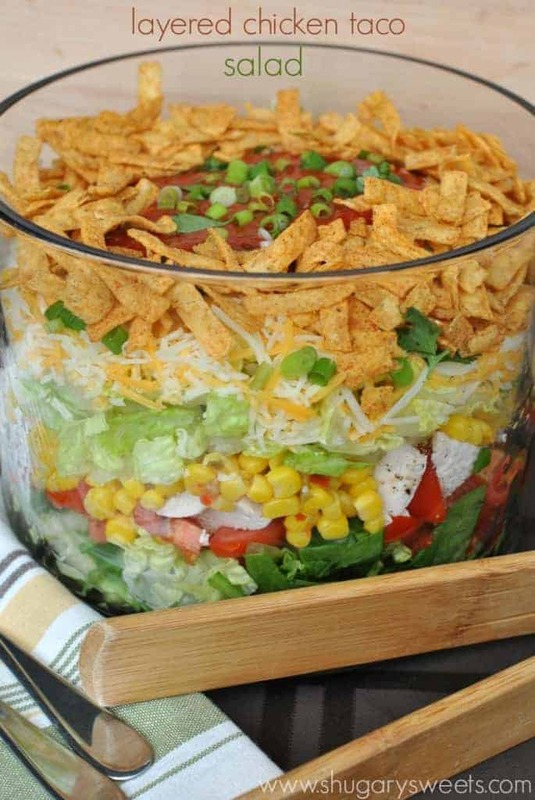 Mix all the ingredients in a large bowl until fully combined. To serve, lay a piece of romaine lettuce (optional) onto a wheat tortilla (or bread). 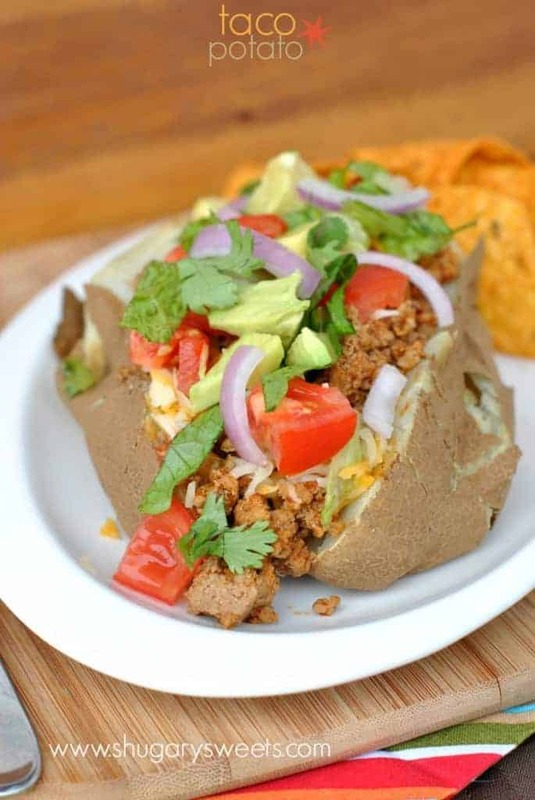 Want more “healthy” dinner options? 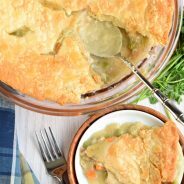 Great dinners from around the blogs…. Eat healthy with all that candy in the house? I’m not sure I can resist…oh wait, I didn’t. Reese’s PB cups for lunch today! Ok, fine I need some healthy meals to balance it all out 🙂 Love that you put this on a whole wheat tortilla!!! 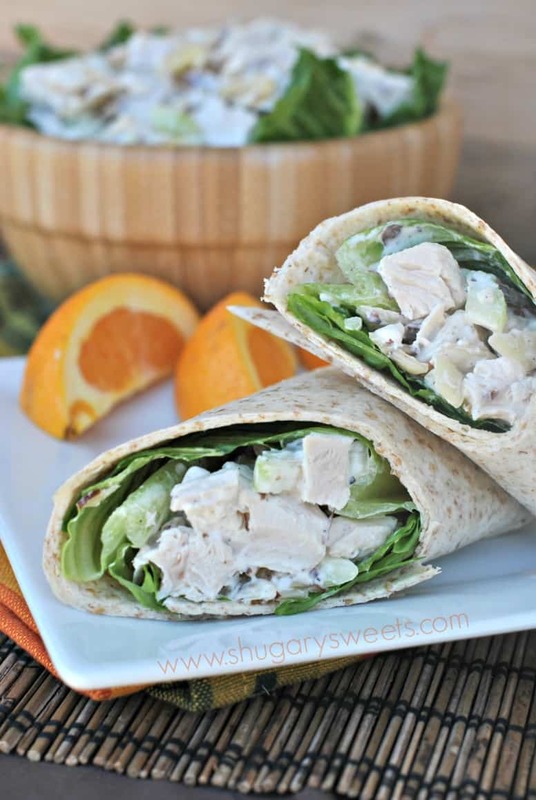 Hmmm, I’ve never put sour cream in my chicken salad…need to try that! Adds a nice creamy texture. I’ve also used plain greek yogurt when there is no sour cream in the house. Works great too! I like that your blog isn’t all sweets. I like the idea of wrapped salad because it is very easy and comfortable to eat it, especially when you have a party and you don`t need a plenty of plates for all the guests. I`m sure that it is also very tasty. Loooooove this, Amy. 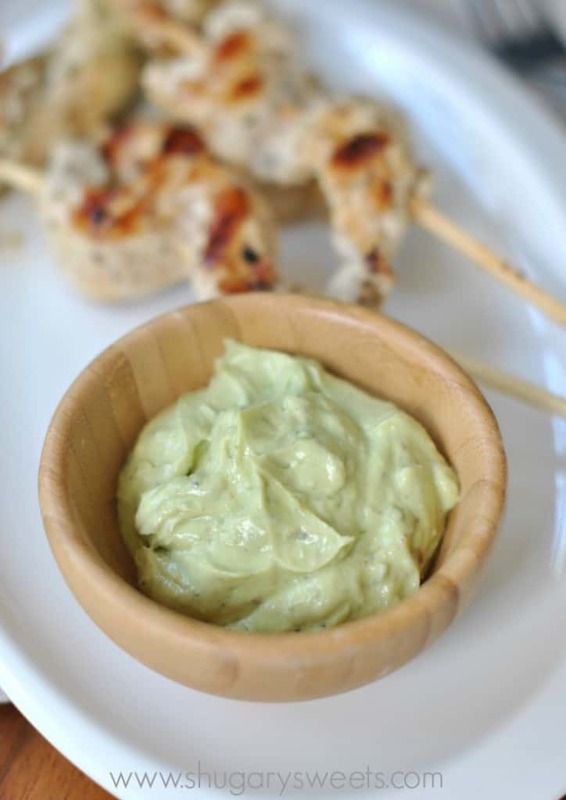 Chicken Salad is one of my favorites, but I usually spread it on toast. 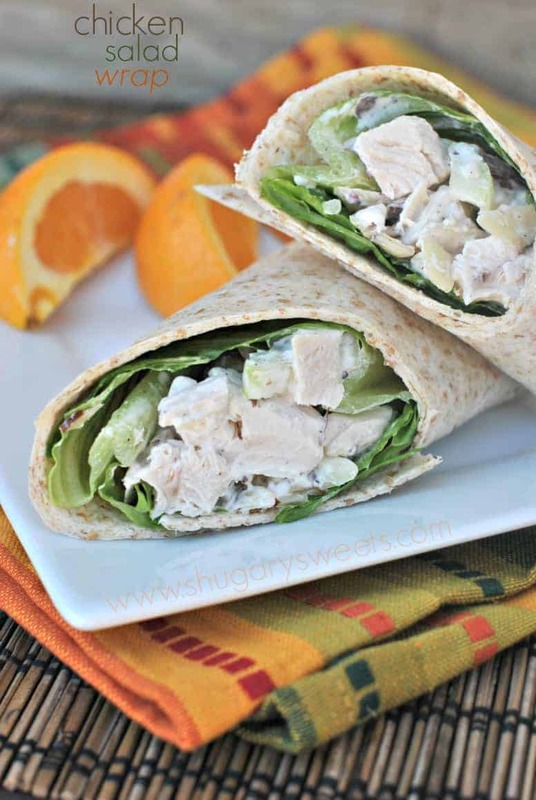 I love the idea of a wrap! AIMEE. There. I fixed it. Yum! 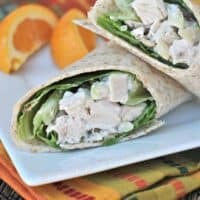 Wonderful recipe 🙂 my husband adores chicken salad! Can you freeze this chicken salad once made? I’m not sure, I haven’t tried. But I would think no because of the mayo.